I graduated from Utah State University—Go Aggies!—which is located in beautiful Cache Valley, Utah. It really is beautiful. There are mountains on both sides of the valley with many fields and lots of open space. It has grown significantly, even since I attended school there. My husband and I wish we could have stayed, but there weren’t enough jobs. When Ryan Nelson contacted me earlier this year about reading his book, I had a long list of books I had already scheduled to review. Knowing it was about Cache Valley, though, I couldn’t resist. It’s taken me awhile, but I finally read it. 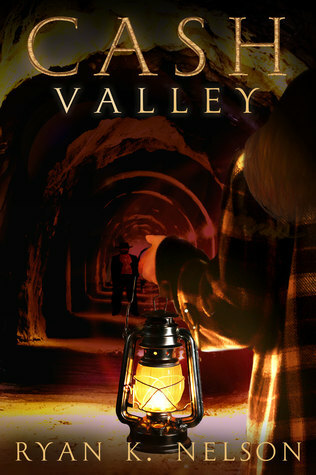 I hope you enjoy my book review of Cash Valley by Ryan K. Nelson! “When FBI Agent Alex Travis receives an anonymous phone call on a September morning in 1954, with a tip concerning the now cold case of the Cache County Bank robbery, it has his undivided attention. The tip leads Travis to the top of the secluded Green Canyon in Logan, Utah, where a young man named Jack Pepper proceeds to tell a story. It spans the two years from the time of the robbery, when he and his girlfriend, Kate Austin, stumbled upon the crime of the century for the Cache Valley. Travis must decide if he is dealing with the suspects or the victims of one of the largest bank robberies in U.S. history. This book hooked me from the beginning. Agent Travis of the FBI receives an anonymous phone call. The caller says he has a tip about the Cache County Bank robbery, which is Travis’ case. The caller doesn’t give any information except to tell him where to meet this mysterious person. Agent Travis is perplexed. Should he trust this caller? Does he need to take back-up or is he ok to go alone? In the end, he decides to go alone. I like Agent Travis’ character. He seems like a good, hard working, decent guy. His character is well developed and likable. I did think the part in the beginning where he is telling his wife the history of Sardine Canyon (the canyon you drive through to get to Logan from Salt Lake City) was cheesy and unnecessary. When Agent Travis meets Jack, the whole thing is still a bit mysterious, which I liked. As a reader, you don’t know if you should trust Jack or not. Jack’s character is a bit more mysterious to start off. As you learn his story, you begin to trust him. However, in the back of your mind you’re still wondering if you should trust him or not. I liked how he was written in that way. Then later, when Kate comes into the picture, you start to see more of the full story. I liked how the plot unfolded like that. I also liked Kate a lot. Her character is also well developed, likeable, and realistic. The whole plot line seemed mostly realistic. There were a couple of parts that I thought were a bit of a stretch, but they made it more exciting to read. I liked how it all came together in the end; everyone kind of ended up where they should have. Overall, I enjoyed this book. I liked reading about the canyons; it made me want to take my kids up there and do some exploring! And if you’re ever up on the USU campus, make sure you get some Aggie ice cream; it’s the best!! Disclosure: I did receive a free copy of this book in exchange for my honest review. Signup to receive a weekly newsletter plus occasional emails about special offers or promotions. The information you provide on this form will only be used to provide you with news, updates, and an occasional promotion. Your privacy is important to us! We will send you a weekly newsletter plus occasional emails about promotions, new products and important updates to keep you in the loop.